Even if you've never heard of them before, but have a sweet tooth or enjoy the occasional sweet snack, you MUST try this easy recipe! A half a kg of wheat flour. 2 tablespoons of plain/natural yogurt. A little water to make a thick batter. Enough oil for deep frying. A quarter teaspoon cardamoms powder. A half amount of sugar of water. Mix flour, yeast, yogurt, water and a tablespoon of oil together and beat with your fingers into a thick batter. Leave the batter to rise 2 times as it was before. Once it has risen, heat enough frying oil in a frying pan. Mix the risen batter again with your fingers. Get a bowl of water and keep aside. Dip your fingers in the bowl every time you want to fetch a new ball of kaimati to dip into the oil. Fetch a very small amount of batter with the tips of your fingers, then use your thumb to toast it into the deep frying oil. Fill the pot with kaimati balls. Keep turning the balls till they are golden brown. Remove them from fire and strain them adding some more to the oil to cook. Put the sugar in a glass and see where the level should be. Pour in a different cooking pot. Now get a little amount of water half the size of the sugar. You can use the glass to measure. Put the cardamoms and stir the mixture over low heat till it bubbles and thickens. Put your kaimatis in it and toast into the air a little for all of them to be coated with the sugar syrup. 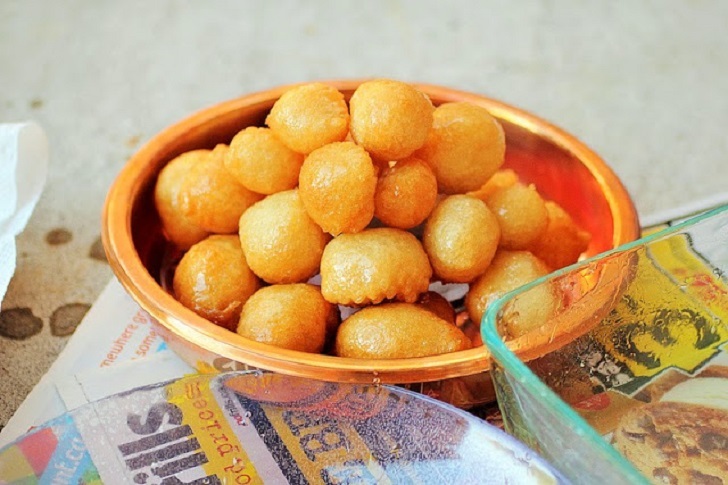 NOTE: For those who don't wish to use sugar syrup for coating, they can buy the cheapest tin of condensed sweetened milk they can find in the supermarket and sprinkle into the already cooked and cool kaimatis for a finger licking taste.